I've only recently discovered these two fine young brits, and when I kept seeing them pop up in Rolling Stone I figured they had to have "made the scene" as they sometimes say some places. Indie at it's truest form, that's how I'd describe these guys. Clever, melancholy lyrics (the vocals often multi-tracked, Elliott Smith-like), a dash of alt-country/folk, a lingering devotion to Rubber Soul and some kind of gimmick. 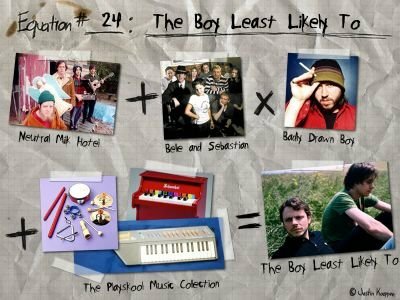 TBLLT's gimmick happens to be that they robbed a day-care center of all the toy musical instruments they could carry and use them to build a style that's both precious and sincere, as though they were finding a direct method for channeling their inner children. The result is a very listenable, often heart-warming, bunch of smart songs dealing with the typical indie subject matter: love, rejection, fear and loss. Rob Gordon with your baby cousin on xylophone.